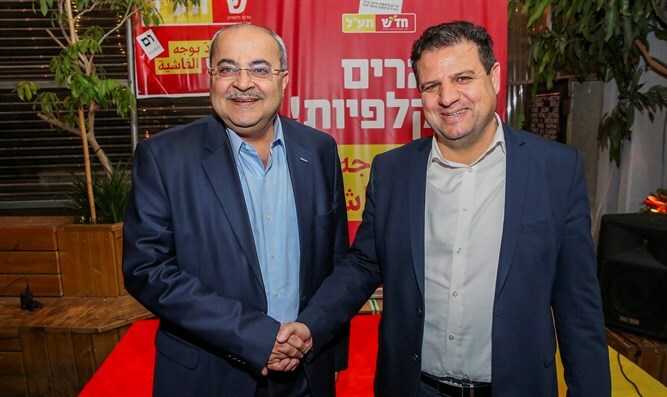 Leaders of Arab Hadash-Ta'al party slam PM Netanyahu, refuse to stand behind Blue and White leader Benny Gantz. Representatives of the Arab Hadash and Ta'al parties told Israeli President Reuven Rivlin that the party would not recommend either Blue and White leader Benny Gantz or Likud leader Israeli Prime Minister Binyamin Netanyahu for the premiership. Ta'al Chairman Ahmad Tibi claimed that the party had been through "the worst elections." "The claim that we're streaming to the polling stations creates second-class citizens and voters. Think about what would happen if they would place 1,300 cameras in Arab neighborhoods in France," he said. "We were sacrificed due to our basic right to vote and choose. We also need to examine ourselves and we're looking to the future. The Prime Minister is an enemy of the Arab public and harms it, and we did not manage to change the votes and Netanyahu was chosen by the Jewish public. Unfortunately Gantz did not discuss the Arab citizens and was afraid to talk about them, and so we do not recommend anyone. We hope that the Nationality Law is canceled and that there will be more budgets for the Arab sector, and that the crime in the Arab sector will be dealt with." Hadash Chairman Ayman Odeh also said that he does "not recommend anyone for Prime Minister." "We went through a most difficult period of elections, which was characterized by the Prime Minister's wild incitement. There was never such thing since the establishment of the state. The elections were characterized by wild incitement by the Prime Minister personally. The cameras inside the polling stations were supposed to deter the Arab population." Likud activists placed 1,300 hidden cameras in Arab polling booths due to widespread attempts at election fraud during 2015's elections. Israel's Nationality Law, which passed last year, states that Israel is the Jewish people's nation state and establishes as law Israel's flag, symbols, the Hebrew language, and various other items mentioned in the Declaration of Independence. It does not affect the rights of Israel's minority citizens.